Israeli soldiers invaded, on Wednesday at dawn, many Palestinians communities in several parts of the occupied West Bank, searched and ransacked homes an abducted seven Palestinians, including a former political prisoner, in addition to invading the homes of a legislator and two journalists. 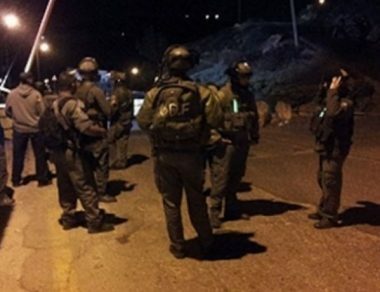 The Nablus office of the Palestinian Prisoners’ Society (PPS), in northern West Bank, said the soldiers invaded Rujeib Meadow area and Rujeib town, in addition to Jerusalem Street in Nablus city, before storming and ransacking homes. One of the invaded homes in Rujeib town is owned by a journalist identified as ‘Ameed Dweikat, in addition to the home of journalist Nasser Eshteyya in Salem town, where the soldiers also invaded and ransacked several other homes. The soldiers abducted a student of Najah National University in Nablus, identified as Mohammad Bader Hamadna, from his home in Asira ash-Shamaliya town, north of Nablus. Furthermore, the soldiers abducted a former political prisoner, identified as Tareq Nayef al-Ayasa, 33, from his home in Sanour village, south of the northern west Bank city of Jenin. Another Palestinian, identified as Qassam Najm, was abducted from his home in Saris town, near Jenin. Also in Jenin, the soldiers invaded Silat al-Harithiya town, northwest of Jenin, searched homes and abducted Khaled Abdul-Aziz Jaradat and Mohammad Yahya Tahaina. In Hebron, in southern West Bank, the soldiers abducted Ahmad Haitham al-Qawasma, from his home in the city. In addition, the soldiers invaded homes in Harmala village, east of Bethlehem, and abducted Ibrahim az-Zeer. In related news, the soldiers invaded the home of Legislative Council member Anwar Zboun, in Bethlehem city, and searched it.